The only cookbook that wants to get you out of the kitchen! This is the hilarious story of Jamie Geller, a spunky young TV exec who came into marriage and kosher cooking without knowing a spatula from a saucepan. Determined to master cooking, yet pressed for time, she was dismayed to find that most cookbooks consider an hour of preparation time quick, and presumed more culinary skill than many of us have. 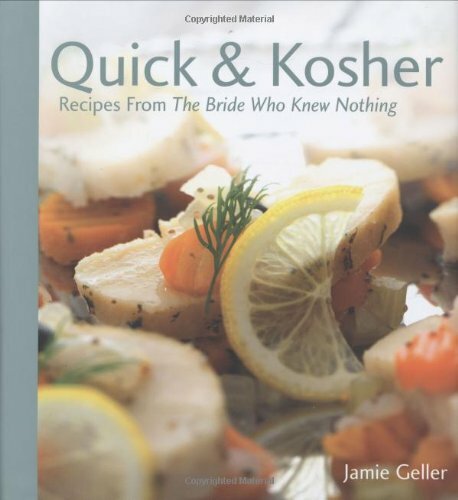 So Jamie set out to compile her own special collection of quick and easy recipes and Quick & Kosher is the result of her quest. This one-of-a-kind cookbook contains more than 160 recipes requiring no more than 15 minutes to prepare, 120 full-color photos, clear step-by-step instructions, reliable prep and cooking times, tips and techniques, and advice on pairing wines with various dishes. Recipes range from traditional to exotic, and are well indexed and cross-referenced. Several special sections such as Setting up Your Kitchen, Secrets of the 15-Minute Chef and Shopping Like an Expert are the result of extensive insider interviews with food professionals who helped facilitate Jamie's path to culinary mastery. These sections offer practical answers to the questions you've always wanted to ask: how do I buy meat, fish, produce, groceries, and wine? Is this a cookbook? An autobiography? A kitchen handbook for brides? It is all of these and more, for Quick & Kosher will amuse, inspire and teach even skilled cooks a thing or two. I wrote Quick & Kosher says Jamie Geller, because you and I are in the same boat. We want to serve up something tantalizing for dinner, but between kids, careers, and carpools, we have no time to patchka!